PocketSat3 is an iPod/iPhone application developed by an amateur radio operator for tracking man-made satellites that circle the earth. It's not inexpensive as Apps go, $24.00. So you should read about it first, here. 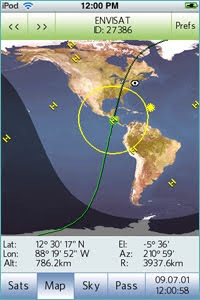 The app developer, Jim Berry, also suggests going to the Visual Satellite's Observer's Homepage for just getting started on learning about and tracking the satellites one can see.